Wallabies coach Robbie Deans has made three injury-enforced changes to his preliminary 25-man squad that will assemble in Sydney on Sunday to begin preparations for the test series against the British & Irish Lions. Melbourne Rebels half-back Nick Phipps, New South Wales Waratahs lock Kane Douglas and Western Force loose forward Ben McCalman have been added to the group, replacing Digby Ioane, Sitaleki Timani and Scott Higginbotham. Timani and Higginbotham have dropped out of the preliminary squad because of injuries sustained during Super Rugby round 16 matches, and their prospects of facing the Lions will be determined after scans for their respective thumb and shoulder complaints. Timani left the field with what was believed to be a broken thumb during the Waratahs' one-point loss to the Crusaders in Christchurch on Friday night, with the scans held over until after the team had returned to Sydney. Douglas, who celebrated his 27th birthday last Tuesday, received his Test introduction against Argentina on the Gold Coast in 2012. Props: Ben Alexander (Brumbies), Sekope Kepu (Waratahs), Benn Robinson (Waratahs), James Slipper (Reds). Hookers: Stephen Moore (Brumbies), Saia Faingaa (Reds). Locks: Kane Douglas (Waratahs), James Horwill (Reds), Rob Simmons (Reds), (Sitaleki Timani, Waratahs, dropped due to injury). 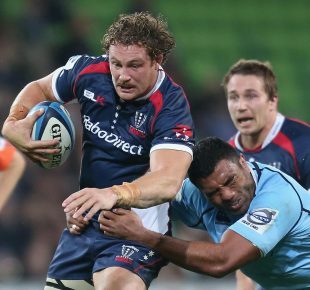 Backrowers: Dave Dennis (Waratahs), Liam Gill (Reds), Michael Hooper (Waratahs), Ben McCalman (Force), Ben Mowen (Brumbies), Wycliff Palu (Waratahs) (Scott Higginbotham, Rebels, dropped due to injury). Half-backs: Will Genia (Reds), Nick Phipps (Rebels). Five-eighths: Christian Lealiifano (Brumbies), James O'Connor (Rebels). Centres: Adam Ashley-Cooper (Waratahs), Rob Horne (Waratahs). Wingers: Nick Cummins (Force), Digby Ioane (Reds), Joe Tomane (Brumbies). Fullbacks: Berrick Barnes (Waratahs), Israel Folau (Waratahs). Higginbotham has dropped out of the squad after dislocating a shoulder during the Super Rugby loss to Queensland Reds, the Melbourne Rebels skipper remaining in Brisbane for scans while the Wallabies assemble. His absence has paved the way for McCalman to rejoin the Wallabies after a 12-month absence, having missed all of last year's Test season himself due to injury. McCalman, 25, debuted against South Africa in the 2010 Tri Nations, and played the most recent of his 21 Tests in the 24-18 win over Wales in Cardiff that concluded the 2011 season. McCalman recently earned his 50th Super Rugby cap for the Force, and he had been due to appear against the Lions in Perth on Wednesday. Ioane recently underwent an operation to repair an articular cartilage complaint in his left knee, having returned home from the Reds' two-match tour of South Africa after the opening fixture against the Cheetahs at Bloemfontein. He is unable to train for some of the preparation time in the lead-up to the opening Test against the Lions in Brisbane on June 22, so the decision was made to replace him among the preliminary squad although he is still joining his team-mates in Sydney to continue his rehabilitation. "Digby is unable to train," Deans said. "His focus is on getting his knee right, which is why we've chosen to bring him in anyway, so we our medical staff can oversee the process. His absence from training opened up the opportunity to add another player. Nick has been playing well, has background with us through his experience last year and is a player who was always in our thoughts." The selection of Phipps, who represented Australia in nine Tests last year, boosts to two the number of half-backs in the preliminary Wallabies squad, joining Will Genia. Deans says that Brumbies half-back Nic White, who has also been playing well, may yet be added to the group among the final six players named. White will play for the Brumbies against the Rebels in Canberra in Super Rugby round 17. Phipps described the call up as a "pleasant surprise", saying he felt he had "left my run too late" after starring in the Rebels' upset win over the Stormers of South Africa just days before the preliminary Wallabies squad was named. "I'd been going OK, but felt my performance in that game, after I got on, was a step up from where I'd been," Phipps said. "Possibly I'd been trying a bit too hard. I've really enjoyed my time with the Wallabies, especially last year when I got a few starts, and was pretty keen to get back there. I guess, like every other player in the country, I'm desperate to have a crack at the Lions. It's a once in a lifetime opportunity, one that a lot of players don't get." Former Australia Sevens representative Phipps, a foundation member at the Rebels, where he became the first player from the club to make the Wallabies, debuted in the gold jumper against Munster on the 2010 Spring Tour before being introduced at Test level a year later against Samoa. He then played nine in 2012, taking over as Australia's starting half-back after a knee injury ended Genia's season during the successful Mandela Challenge Plate defence against South Africa at Perth. He started in all but one of the eight tests after Genia's injury, playing a key role in the come-from-behind win over Argentina on the Gold Coast and in the win over England at Twickenham that reclaimed the Cook Cup. "Nick proved last year that he had the qualities to make a difference in the Test arena," Deans said. He was called on at a time of great adversity and responded. His work rate makes a big difference to those around him, as does his enthusiasm both on and off the field. Honored and humbled by the opportunity to join the @qantaswallabies in camp for the Lions tour. Excited to get stuck in to camp! "Pleasingly he has taken the benefits of his experience from last year back to the Rebels and added to them. He has been a point of difference player for the team this year and one of the leaders within their group." Deans acknowledged that Phipps' Test background, and his familiarity with the European playing style that the Lions will bring, had been considerations in his selection.